Duration of results: Results last months to years. ReLume™ is a light device which has been FDA approved to treat areas of lost pigmentation, such as scars and stretch marks. ReLume™'s system uses flashes of light to restore melanin to treated areas of the skin. The system's fiber-optic technology allows the light to be both intense and precise. Those with light and shallow scars and are ideal candidates. Those with burns or other areas of lost, light pigmentation are also good candidates. ReLume™ treatments are usually pain-free. There may be some residual redness for several days. Usually there is no downtime, but direct sunlight should be avoided for a few days after treatment. Light colored scars and some stretch marks may fade with time as melanin is restored. Areas of lost pigmentation generally respond better when they are new or shallow. How long does a ReLume™ treatment last? 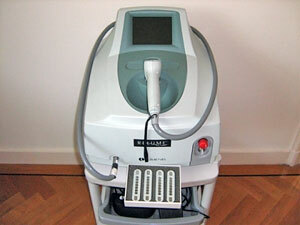 Five to ten weekly treatments may result in a 50% to 70% reduction in the appearance of scars or stretch marks. Results can be maintained with follow-up treatments once a month. Individual results may vary, consult your doctor to make sure you are a good candidate for this treatment. The treated skin may be mildly red or irritated for a few hours after treatment, similar to a sunburn. Apply SPF 30 or higher every day, and avoid direct sunlight for three months after the procedure.